ArmoiseÂcre, Artemisia dracunculus, Dragonne, Mugwort, Estragon, Estragón, Herbe Dragon, Artemisia glauca, Herbeau Dragon, Little Dragon, Petit Dragon. Tarragon is a perennial plant of the Asteraceae family. In Europe, they are distributed primarily with two subspecies of tarragon - French and Russian. As a spice are used parts outer stem with leaves and flowers. Cultivated in almost all of Europe, Russia, Africa and North America. Used as agarnish, in salads or in sauce, tartar sauce, béarnaise sauce, helpful in French sauces like bernaise and tartare. Dried Tarragon is tasty and attractive in mayonnaise, French dressing and melted butter sauce. Dried Tarragon is used in fish and shellfish, turkey, chicken, veal and many egg dishes. Use it in seasoned vinegar, herbed butter or herbed mayonnaise. Often utilised as a part of cream sauces and soups, and with eggs, sharp cream, cheeses and also yoghurt. 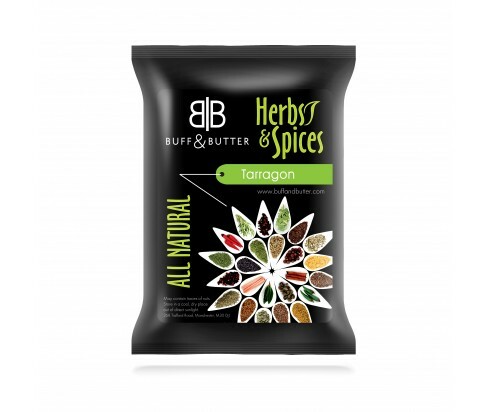 Tarragon enhances the taste of pork, lamb, shellfish, beef, poultry, potatoes, pâtés, leeks, carrots, tomatoes, or artichokes. It is used as enhancing base in Christmas bread called -potica. Tarragon herb has been used as a solution for dyspepsia, anorexia,hiccups and flatulence. Tarragon tea may cure a sleeping disorder. Used as atraditional medicine for appetite stimulation. Helpprevent heart attacks and stroke. As a sort of local anaesthetic, tarragon relievesa toothache. The Arabs named it turkhum which means dragon because they found the taste to be very strong or due to its serpentine moulded roots. Tarragon is herb plant with a height of 120 to 150 cm and with a number of thin branches. The leaves are narrow and lance with 2-8 cm length and a width of 2 to 10 millimetres, olive-green colour. The flowers are formed in small capitulum with a diameter of 2-4 mm, and in each capitulum is up to 40 greenish and yellowish-greenish flowers.French tarragon can be grown from seed, but only by dividing the rhizome of the plant. Russian tarragon has less flavour and is grown from seed. Tarragon contains 0.80% essential oil (60-75% estragole), flavonoids, glycosides, inulin, vitamins and others. By steam distillation of the fresh or dried twigs is producing the essential oil.